1 in 4 people will suffer from a mental health problem in their lifetime. To me this implies that society is highly toxic. I think that the people getting sick are like the canaries in the mineshaft. 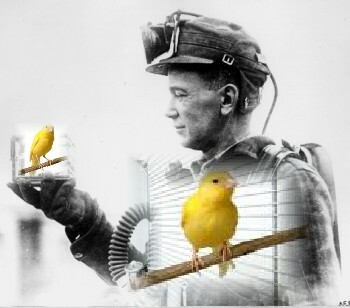 (Coal miners used to take a canary down the mine with them as if gas was detected the canary would pass out first due to it’s smaller lung capacity). Should we be making society less toxic instead of medicating or ‘curing’ the sensitive people. I feel society should accommodate sensitive people just as we accommodate people with mobility issues. I don’t like too much noise. So please don’t blast loud music at the gym. Also make it culturally acceptable and ok for sensitive young people to not like going to nightclubs! Have regulations and laws against pathetic and toxic office politics that harm people. Imprison the highly toxic people instead of letting them run the large corporations and banks. Unfortunately the sociopaths rise to the top which needs to change. 25% of the population is definitely a sign that something is wrong with society. Let’s get rid of the toxicity. ← Experts or Bores Stating the Obvious?